I often make one small whole turkey and an extra turkey breast for my Thanksgiving. Most of the crowd at my house prefers white meat, and I really like it left over for sandwiches, so this plan makes the most sense for our holiday. 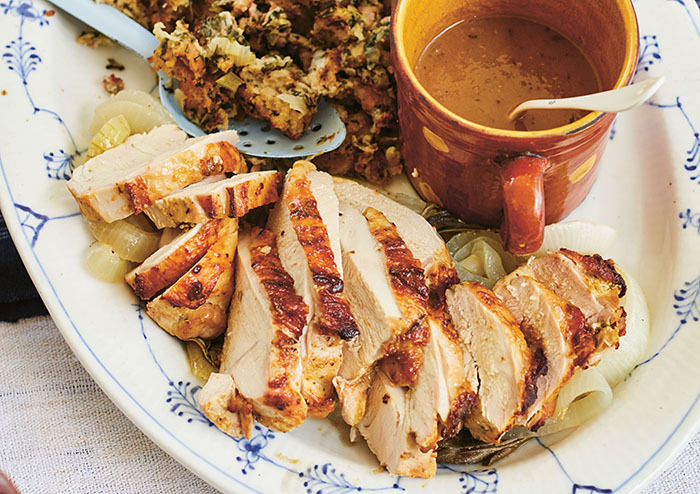 This is my go-to recipe for turkey breast that is the opposite of dry and boring and also cooks so quickly, which is the antithesis of most Thanksgiving turkey. The real trick here is getting boneless, skin-on turkey breasts, which you essentially treat as really large boneless chicken breasts. To serve twelve, you’ll need more than one turkey breast. If you don’t have a roasting pan large enough to roast the turkey breasts in a single layer, use two pans (double the onions, oil, and water and rotate the pans halfway through roasting). 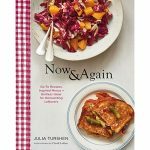 Reprinted from Now & Again by Julia Turshen with permission by Chronicle Books, 2018. Photo copyright © 2018 David Loftus. Preheat your oven to 425°F [220°C]. In a small bowl, stir together the mustard, salt, and pepper. Pick 12 sage leaves from their stems (reserve the stems and the remaining sage), mince them, add them to the mustard mixture, and mix well. Rub the mixture all over the turkey breasts. If you have time, it’s nice to let the meat sit at room temperature for an hour with the seasonings before roasting (or up to overnight in the refrigerator, but bring it back to room temperature before roasting). Place the onions on the bottom of a roasting pan large enough to hold the turkey breasts comfortably in a single layer. Drizzle with the olive oil and arrange the remaining sage (including the stems from the leaves you minced) over the onions. Place the turkey breasts, skin-side up, on top of the onions. Pour the water into the pan, being careful not to pour it directly on the turkey. Roast the turkey until the skin is golden brown, about 30 minutes. Turn the oven down to 350°F [180°C] and continue to roast until the turkey is firm to the touch and an instant-read thermometer inserted in the thickest part of each breast registers 165°F [75°C], 25 to 35 more minutes, depending on the thickness. Transfer the turkey breasts to a cutting board and let them rest for at least 15 minutes. Remove and discard the sage leaves from the roasting pan and transfer the onions to a serving platter, preferably a warmed one. Transfer the pan juices to your gravy and let them simmer and make the gravy even better than it already is. Alternatively, if you’re not making gravy, keep the pan juices for serving. Once rested, slice the turkey as thinly or thickly as you like. Place the slices on top of the onions and drizzle with the gravy or pan juices. Serve warm. Note: If you can find only bone-in turkey breasts, either have your butcher take them off the bone or do it yourself (it’s not as hard as it seems; just get a sharp knife and follow the bones) and use the bones for stock for your gravy. If you buy turkey breasts on the bone, note that they should weigh more (add about 2 lb/910 g to the total weight). 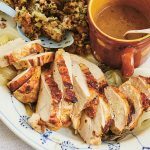 If your turkey breasts come tied like a roast or in netting, remove all of that and just keep them nice and flat (this way they will cook more quickly and are less likely to dry out).